While Iranian officials, including the parliament speaker, say they hope Europe will work with them to preserve the deal, many are pessimistic. The government backlash reflected broad public anger in Iran over Trump’s decision, which threatens to destroy the landmark agreement. While Iranian officials, including the parliament speaker, say they hope Europe will work with them to preserve the deal, many are pessimistic. In comments before school teachers, Khamenei told Trump: “You cannot do a damn thing!” The exhortation from Khamenei, who has final say on all state matters, follows a pattern of Iranian leaders declaring their nation’s ability to resist foreign pressure or interference. Khamenei described Trump’s speech as having “over 10 lies,” without elaborating on them. He also said Trump’s remarks threatened both Iran’s people and its theocratic government. Earlier Wednesday, the lawmakers, including a Shiite cleric, held the flaming flag alight as their colleagues joined their chants. They also burned a piece of paper representing the nuclear deal and stomped on the papers’ ashes. While U.S. flag-burning is common in Iran and harsh criticism of America has been a staple of Iranian parliamentary politics for years, it was the first time political observers could remember anything being burned inside the parliament itself. The 2015 agreement imposed restrictions on Iran’s nuclear program in return for the lifting of most U.S. and international sanctions. However, the deal came with time limits and did not address Iran’s ballistic missile program or its regional policies in Syria and elsewhere. Trump has repeatedly pointed to those omissions in referring to the accord as the “worst deal ever.” Proponents of the deal have said those time limits were meant to encourage more discussion with Iran in the future that could eventually address other concerns. 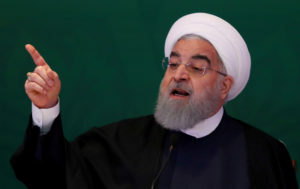 Late Tuesday night, President Hassan Rouhani said he’d be sending Iranian Foreign Minister Mohammad Javad Zarif to the countries still in the deal — China, France, Germany, Russia and the United Kingdom. Iran hopes the European Union will pass laws to protect European firms from any potential U.S. sanctions. EU officials have suggested they’ll do what they can to salvage the agreement. 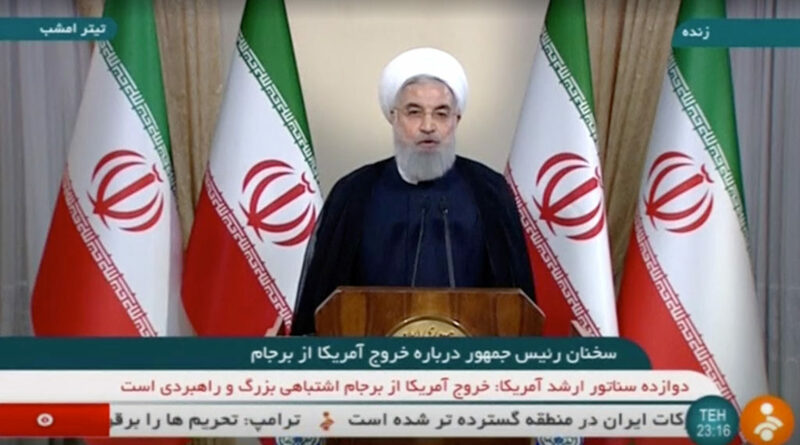 Still, Rouhani made a point of stressing that Iran, at any time, could resume its nuclear program. Wednesday morning after the flag burning, parliament speaker Ali Larijani said responsibility for saving the deal fell on the EU and other world powers still in the accord. “The period is only a window in which the EU can prove if it has enough weight for settling down international issues or not?” he said. Many Iranians are worried about what Trump’s decision could mean for their country. The Iranian rial is already trading on the black market at 66,000 to the dollar, despite a government-set rate of 42,000 rials. Many say they have not seen any benefits from the nuclear deal. Iran’s poor economy and unemployment sparked nationwide protests in December and January that saw at least 25 people killed and, reportedly, nearly 5,000 arrested. What scrapping the Iran nuclear deal could mean for the U.S.